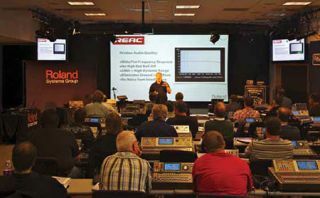 Roland’s hands-on reseller training in Vancouver, B.C. Canada. Sometimes it’s good practice to blur your lines. Take the field of end user-focused training initiatives. With variables such as audience expectations and presentation preferences, the means are many but designed to reach a common goal: to benefit the integrator. “If an integrator is interfacing with an end user who knows, in general, what he or she wants to accomplish but has no knowledge of the varying solutions or the available technology, then the integrator must hold his or her hand and lead him or her down the path from the most elementary starting point,” added Bergum, who also handles Vaddio’s in-house sales training. Most end users now have at least some degree of knowledge of computers, smartphones, tablets, and other personal networking platforms, but the AV technology solutions that integrators need to interface with these platforms aren’t always as familiar. Requests for end user-focused training are coming from several directions: from sales reps, distributors, and integrators, said Brooke Macomber, managing director of global sales and marketing at Symetrix. Although there is no complete hybridization of training style for a target audience, most audience members need to know the core points, Bergum said. These include answers to the following questions: What is it, how does it work, what markets does it serve, what are some specific applications in these markets, and what’s the value proposition for this solution? In weighing the delivery options for training, in person or online, there are several considerations, including specific personal preferences. It’s human nature to prefer to gain what knowledge is needed as quickly as possible, so for broad subjects that simply communicate “here’s this new thing, and here’s how it works,” an online video description is always great, explained Bergum. “But, with high-tech integrated systems or solutions that require programming and technical understanding, a simple online video simply won’t suffice,” he said. Symetrix offers the full spectrum of training options from in person, to webinars, to self-paced video tutorials that allow partners to increase their competency across solutions, Macomber noted. “By understanding how to use the products effectively with real world applications, partners can select the training courses to build competencies that complement their overall partner strategies and application focus,” she said. The bottom line? Online, live interactive training is certainly more effective if the audience isn’t too big and has the opportunity to chime in with its questions and input, Bergum noted, and it’s the best way for people to experience online solutions from the standpoint of the faraway end user.